Under the bonnet of the Canon MP520 lies a neat row of four individually replaceable ink cartridges, from Canon's latest ChromaLife 100 range. This marries a pigment-based black ink with dye-based cyan, magenta and yellow inks, theoretically enabling fast, high-quality document printing and passable photo output. In our tests, mono document printing proved very speedy and the MP520 is no slouch for colour DTP, either. Text and graphics quality is very good, with crisp font edges and solid colour performance. Running costs are quite low, which is a real bonus considering the budget purchase price of the printer. Colour printing worked out reasonably cheap too. 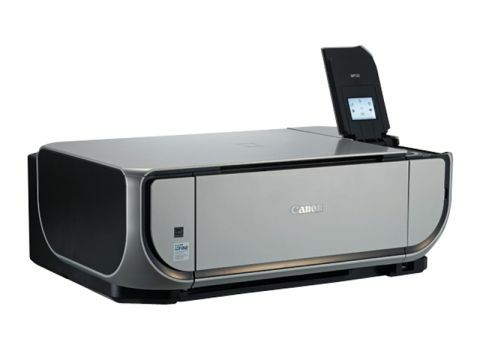 While the MP520 is immensely capable as a document printer, it does leave a little to be desired for photo output. The contrast generated by the four-ink system is noticeably lacking and photos have little punch, with what should be deep colours looking rather insipid. Plus points include dual paper input trays, so you can keep standard paper in the bottom one and use photo paper or other specialist paper in the rear tray. Scanning quality is well above average and direct photo printing is particularly straightforward. Overall though, the Canon MP520 is very much the poor relation to the mightier Canon MP610. If you can stretch the budget by another £30 or so, go for the better Canon.